In this Sermon from Samoa, I quote a Samoa Observer Editorial in full (that is in essence a sermon in itself). I expand on the writer’s exhortation to share love, interspersing my comments to show that love is not the antidote to pride, applying this teaching specifically to the Samoan context. An editorial by Mata’afa [Matai title name] Keni [First name] Lesa [Surname] in the Samoa Observer 16 January 2015 follows with my comments. In essence the writer calls upon Samoa to love, assuming that this is the antidote to the ills that befall the country. In my comments following I teach that LOVE must be mixed equally with TRUTH but that HUMILITY is actually a deeper, more powerful, ultimately the only successful and longer-lasting solution, for humility is the opposite of (and antidote to) the root cause of Samoa’s ills . . . PRIDE. It’s a vicious cycle but that’s precisely what’s happening in the world today. Yes. Dealing with behaviour without understanding the cause though, is like a doctor issuing Panadol for a broken bone – it may help a little but doesn’t address the core issues. A doctor needs to reset the bone and protect it until the healing is complete. Love is not the complete antidote to the ills of the world. Humility is the antidote to pride, which is the core of the issues that the writer is addressing. You see; we live at a time where our so-called progress in all facets of life has come at a huge cost. Yes humankind has succeeded in many areas but in our haste to keep abreast with the changing world, we’ve somehow inadvertently nurtured a lonely and an angry generation of people. Samoa addresses the challenges of physical loneliness very, very well with its strong family focus. This though is a matter of cultural conduct that actually causes secondary human personality issues and a different kind of loneliness but she really does harbour an enormous amount of anger. While there are a few humble people here I’m sure, the vast majority of Samoans I have met and engaged with over the last 5 years have deep anger problems that manifest in the oft-reported sad events. Many of them are hurt emotionally, physically and spiritually. Whatever the reason is, people have different outlets of finding ways to release that anger. One area that is a festering issue rarely talked about in Samoa is racial anger, with a deep resentment visible most clearly (believe it or not) in the extreme patriotism displayed on occasion. As a Palagi in Samoa I have and do encounter racism on a constant ongoing basis. 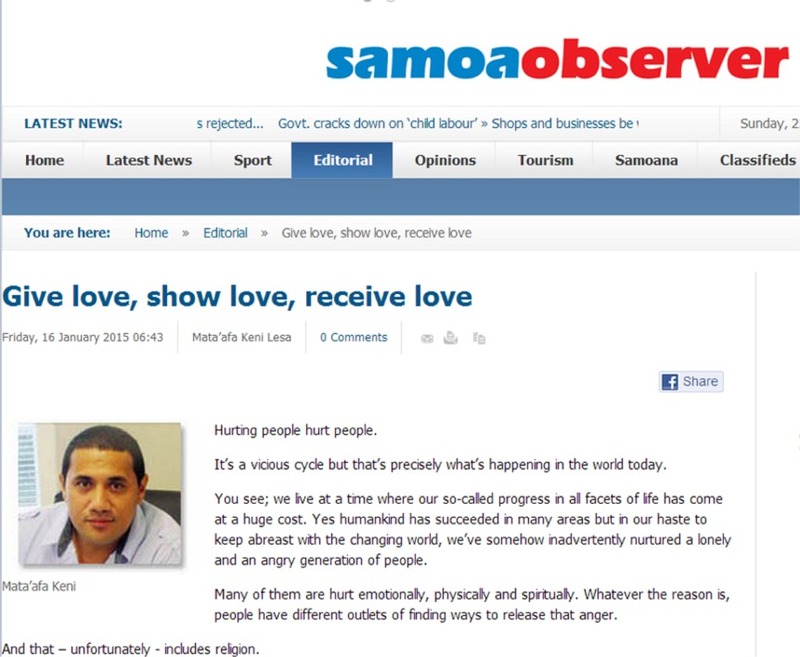 It’s well disguised, totally repressed in all communications channels and in all forums within and outside of Samoa but it’s real, deep, ugly and can be hurtful, as Keni says – hurtful “emotionally, physically and spiritually”. And that – unfortunately – includes religion. I’d hang religious activity in Samoa more onto the power and politics label than the label of anger or the stresses of a changing world. The real issue I see in Samoan religious practices is the CONTROL aspect, not so much the conduct. Samoa is ruled [spiritually] by the Spirit of Fear. This is the root cause of the nation’s suicidal tendencies; the saving face activities (this is the Samoan equivalent of the Western world’s “keeping up with the Joneses”) and the widespread and general disinterest in personal development, accountability and responsibility [i.e why work, think or really care when it mostly all goes to others, and others make the decisions anyway?]. Well that depends on your definition of religion doesn’t it? Jesus came to destroy the yoke of oppressive religious practices in the times He lived. His most explosive and violent words and actions were reserved for the religious leaders of the day, so if by “religion” the writer means church activities and religious denominational adherence then I find him in error. If he means faith, as in the capacity to believe, then this is to me, a valid observation. it is after all a fundamental right for people to be free to believe whatever. Where religion goes awry is because of the motives and agenda that drive it. What motivates a particular set of beliefs? What are its goals? What does it set out to achieve? How? Yes. This is dead right. Digging deeper though, and asking meaningful questions, which of course indicate original thought is definitely not a widespread Samoan characteristic! The core mistake that I believe most Samoans make when it comes to religion/faith, is to associate this issue of faith [religion] with a denomination; the church or a particular church. This is a global challenge going back to the beginning of deception but it is a strong influencer in Samoa. Despite the loud rhetoric to the contrary, conduct and association with an authority figure in Samoan society is ‘usually’ more important than an independent relationship of obedience to a personal living God. Now, let’s not kid ourselves here; there are some wicked and very twisted religions out there that set out to heave destruction and desolation upon mankind. Absolutely! And many of them exist in Samoa too. When people talk to me about enforced church giving; exclusive claims to the truth (Catholics, Jehovah’s Witnesses and Mormons are the most obvious but many of the Protestant churches also claim exclusivity of belief); denominational and church adherence that rips families apart, the hidden implication from this writer’s words that Samoa’s churches have it theologically right and others don’t then, I’m sorry, he’s wrong. I agree with many of my Palagi guests who can’t stand the Samoan version of religion, that looks good on a Sunday, then beats their children on Monday, lies on Tuesday, steals on Wednesday, bribes on Thursday, gambles on Friday and gets drunk on Saturday. Whatever happens in church on Sunday with singing [to die for] and pride in big buildings on Sunday tends to pale into insignificance in their unbelieving Palagi minds, but it is with good reason this happens. They were devoting themselves to the apostles’ teaching and to fellowship, to the breaking of bread and to prayer. Reverential awe came over everyone, and many wonders and miraculous signs came about by the apostles. All who believed were together and held everything in common, and they began selling their property and possessions and distributing the proceeds to everyone, as anyone had need. Compared to the incredible results that Luke shares of the early believers who genuinely loved, shared and expressed their joy without the existence of a church, pastor, priest, denominational structure or even church buildings, Samoa has a long way to go when it comes to ‘untwisting religion’! They exist to bring suffering and endless misery to others. The reason is simple; they are angry at the world because they feel that the world has wronged them for one reason or another. They are a bunch of bitter people who believe that their purpose in life is to kill and destroy. It is not always anger from disillusionment that causes people to kill – deception is a big one particularly in the Islaamic regions. I hurt for Samoa, for this sentiment that Samoa’s religion is better than Islaam (let’s be honest, this is the religion Keni is referring to) is founded upon an arrogance and an ignorance of the real state of Samoa’s spiritual health. The bible refers to the mind as the battlefield. All actions [with a few exceptions such as medical and/or spiritual possession ] either come from or are at least controlled by the mind. Samoans though, as a rule, lean more towards the physical and emotional aspects of living than the cognitive ones. In other words, our actions accurately reflect what’s in our hearts. If we’ve been filling our treasuries with hate, of course we will display hate. What the writer says here is correct, in my book, but it is water off a duck’s back to most of Samoa, which is why he and his newspaper has seemingly had to repeat the message ad nauseum for the five years that I’ve followed them. The issue is this . . . nobody does, or will ever attempt to deal with the root cause of these ills, which is PRIDE. Nowhere, at any time in the five years that I have engaged with and lived in Samoa have I ever heard people refer to the root cause of the ills in Paradise – never! It simply never happens that Samoa allows people to refer to Samoa’s arrogance before God. In fact the total opposite is the case and this serious disconnect between perception and reality is the very reason that Samoa struggles with reality so much. The hate that fills our hearts . . . the stuff that Samoa Observer commentators continue to talk about continue with no respite because of . . . you guessed it . . . Samoa’s pride. We don’t need to tell you what’s happening in the world today. You and I know. We see it on television, read it on newspapers, our social media newsfeeds are full of it. Suffice to say, we live in a miserable world where wars and bloody strife continue to claim innocent lives. People are dying everyday from one thing or another. It’s a real tragedy. This is a common deception that Keni has fallen into, just like many other doomsday promoters across the globe. Just add in the next commonly used phrase in many modern deluded Christian circles that “it’s the end of the world shortly” and if you are right into the deception big-time, that “Jesus will be coming again soon [to rapture us all away from a failed and failing world]” and you have the big apostasy. This is the one that drags people away from faith in a powerful God, who has all the time in the world; a Messiah who has already finished His work; an all-powerful Holy Spirit who is doing as much as He is given authority to do by the people whom God has given the authority to [i.e. us] and believing that we are living in some of the most exciting times in the history of the planet as millions of people, under the radar, across the globe are listening to Him, obeying Him and bringing about the Kingdom of God that Jesus talked about so much. Speak depressing news and express fatalism like this though and guess what? The people will believe it; the prophecy will be self-fulfilling and the enemy will laugh all the way to the grave! As a believer in a position of influence this newspaper Editor should know better. There were lots worse times in the past. The magnitude of disasters at different places in the world might be separated by a degree but the end result is still the same, it is death and destruction that robs people of their joy. And when people are unhappy, terrible things happen because of anger, bitterness, self-pity and unforgiveness. Yes, true, and the coming New World Order and global government is on the way BUT exceeding that is the work of the Holy Spirit doing incredible things in individuals’ lives across the globe. In that vein, we’re not going to pretend here that we understand what it is like to lose so many loved ones and people you care about in the space of a day. We look at places like Nigeria for example where thousands of people are killed every day by terrorists. In the Middle East, not a single day goes by without people blowing themselves up in the name of religion and whatnot. These are extreme circumstances. Why people do what they do we might never know. It’s pride, Keni, the root cause of all anti-social, ungodly and self-destructive behaviours. It always has been and always will be. Just identify how it manifests and then you have the prescription for change. That’s all that Jesus did – identify the pride [sin] and give the prescription. The one thing we do know is that we are blessed to be living on this part of the world where peace is guaranteed. It’s true that we are not problem-free ourselves but you’ll have to agree that this is indeed paradise compared to some of those places unimaginable suffering and misery. Looking at the world today, people and world leaders are searching everywhere for answers. I have guests, many who have traveled extensively and from my own experiences moving from one culture to another engaging with Samoa, I can state categorically that Samoans are and Samoa is no different to any other people-group on the planet. The CULTURE is, but the people are not. Samoa has the same problems of pride that my home country New Zealand has, as with Australia, the USA, the UK and any other third world country you care to name. The rich get richer by systemic design. We all suffer from adversity the same – health, pain, death, losses, spiritual distance from our Creator and we all are subject to the same distractions, temptations and challenges that mankind faces. The irony is that as educated as the world has become, there is something terribly amiss about the make up of our society and nobody seems to be able to place a finger on what it is. Jesus did and I observe, analyse, listen to and learn from Him, so I can finger it for you Keni and I just have. It’s pride. Now there are nigh on half a million words on this blog, many that specifically relate to Samoa. It’s always the same root cause of the ills of the world no matter where or what the problem! What we can say is that we seem to be living in a cruel world where love has grown cold. And that’s where we believe the attention needs to focus on. We need to restore that love for God and one another. The first is that the root cause is as I have said, pride. Love is NOT the antidote to pride – humility is. The second thing is that love by itself does not have the enabling ingredients for lasting change. Everyone will adjust their behaviour when loved, but it is only LOVE and TRUTH combined in EQUAL measure that facilitates lasting change. There’s a truckload to this concept which I will keep for another time for space reasons, but there is a lot of love in Samoa, but a dearth of truth, thus you have a severe imbalance in the culture and society. The only place that I have ever found truth and love in equal measure (a perfect balance) is at the cross of Christ. In summary, yes, love is important but so too is truth. This is Samoa though. Nuff said. One of our biggest problems today is that our religions are driven by a petty agenda. That agenda involves disrespecting people, proving that we are superior than the rest and so forth. This is madness. It needs to stop. Well I don’t agree that this is “one of our biggest problems today” in religions by any stretch of the imagination, but what you [Keni] are describing is of course . . . pride. In that sense, yes definitely. In Samoa, we are a Christian country. No. Samoa is not a Christian country, for there can be no such thing as a genuine ‘Christian country’. It is technically impossible for the message of Jesus to be applied at a country level. Christ came to restore individual relationships through the Holy Spirit. Period. He deliberately did NOT touch geo-political issues in any way shape or form. He denied the opportunity afforded him at the outset of His ministry. He referenced Caesar in neutral and derogatory terms and steadfastly refused to integrate with the religious people, systems and structures of the day. a deception of the grandest order, that Samoa is a Christian nation. One of the greatest sadnesses I find about Samoa is the vociferous support for the cult-like mantra, which is an outright lie, a deception of the grandest order, that Samoa is a Christian nation. Yes, church attendance is high and the people are in the main culturally driven to support the Christian faith at a surface level, but repeating this dogma is foolishness and those who do so set themselves up for ridicule. Samoa is no different from any other nation on the planet. Some believe and walk in accordance with the leading of the Holy Spirit. Most don’t. To believe otherwise is arrogance which of course is another name for . . . you’ve got it . . . pride. We abide in Jesus Christ’s teaching of love, forgiveness, mercy and compassion. We believe that it is only through God’s compassion and mercies that we are not consumed. True, that we do need but . . . ! This is the time when what the world really needs is love, the love of God. The world needs to see that love, we need to share that love. We are a loved people and we are loved to love others. Yes . . . this is also true, but . . .
God’s answer when he saw a world suffering was to send love. Love came in the form of a man, his son Jesus Christ whom he sent to die to redeem a rotting world. That is the gospel, the Good News in a nutshell. God’s solution therefore was not a magical potion of some sort. Absolutely, and I love the idea that God’s solution is not a “magic potion” but . . .
Love came in the form of a person and that person set us the perfect example to live life by. Yes, dead right, but . . . Indeed, we are taught that love is patient and kind. It does not envy, it does not boast, it is not proud. It does not dishonour others, it is not self-seeking, it is not easily angered, it keeps no record of wrongs. Love does not delight in evil but rejoices with the truth. It always protects, always trusts, always hopes, always perseveres. Love never fails. Agreed . . . but love by itself is NOT enough. We MUST include truth into that love mixture in order to affect the societal change that the writer hopes for. Samoa doesn’t . . . therefore it is powerless to affect change in the name of God. The results speak for themselves. Samoa has love. It’s hospitality is legendary. It’s love of and for family is an institution. It’s generosity is love in action, visible, meaningful and precious. Yet people punch, kill, backstab, complain to and at each other ad infinitum. It comes down to the conspicuous absence of truth [aka reality]. Let’s be honest shall we? The truth is that family (and the inherent love) is important in Samoa CULTURALLY. Church adherence, support and attendance is important CULTURALLY. Samoa mo [for] Samoa is important CULTURALLY. Generosity and giving is CULTURALLY important. Thus deception is permitted [in fact the norm] in society in order to save face [aka the Fear of Man]. Pastors lie to save face. Churches build bigger to look good. Preachers preach and manipulate in order to get – loyalty, financially, prestige, power and more. People bribe and justify this conduct in the name of their culture. People gamble because it’s done for the benefit of the church coffers. People eat excessively because the feelings of today are more important than long-term health. Others take what is not theirs because they know that most of the time they can get away with it and if they are caught then the culturally appropriate systems will cover up their crimes. How is that for a response to what is happening in the world today? It might sound great in theory but it is a shallow, theoretical pontification selecting only one aspect of the scriptures – a platitude for itching Samoan ears and of no practical use to building the Kingdom of God as Jesus would have done and seeks for us to do. The point is that we need to give love, show love and receive love. We are loved by God to be able to lover other people near and far – including our enemies. Continuing with this streak of honesty, I’ve found a lot more love OUTSIDE of Christendom than in it, and by a large factor too. Sadly, in general the love that I’ve witnessed from non-Christian circles seems so much more real than the conditional love the most Christians offer. Samoa is no different except that for cultural reasons the expectation of a return on the giving is not voiced, whereas in the Western world it is. “I will give this to you because God loves you” is often followed by a subtle but very real, “So I want you to become a Christian, give your life to Jesus [and come to my church etc, etc]”. Love without truth is hollow, powerless and panders to the emotions – not the spirit, which of course is corrupted by the Fall. The truth is that Samoa as a country is as far from the Lord as any other nation on earth. People are deceived by religious systems that defend their existence and are self-serving. The core issue of pride, manifesting in all manner of ills such as that which Samoa experiences in real-time can only ever be dealt to with the co-existing values of love AND truth, which of course is only ever found in the person of Jesus Christ. A prophet however will tell Samoa not only to ‘come down’; humble herself; face reality and then DO the right thing, for the right reason, but HOW to do this. It’s an unpopular message; it costs me to speak it for I’m hated across the country for speaking it, but my message has the power to affect real change. Some do recognise that it contains the very truth missing from the ‘normal’ life of the Samoan. Base your loving on facts and reality as you go out there loving those around you Samoa and, just as the Lord added to the early disciples’ numbers daily in the first days of Christianity, so too will you have an impact in the world. Until then, sorry, but the majority of my guests and I will look at your religion as little different from all the others out there – just ‘noise’. 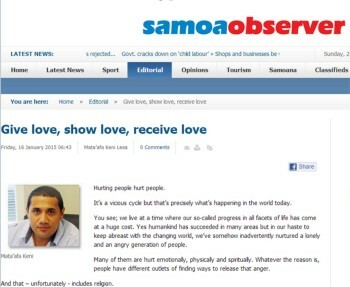 * Despite claims for the moral high ground, Samoa Observer is a business and is all about money. I learned this personally when they ripped me off after reneging on a deal to publish a series of articles entitled Palagi Perspectives. Bottom line was that I produced, exceeding the agreement, they then published my articles, then didn’t deliver as they agreed and packed a sad when I sought an ethical solution! Editor and writer of this editorial, Mata’afa Keni Lesa knows the full story but chose to honour his employer who as I mentioned in the post about it refused to discuss the matter let alone deal to my grievance. Obviously I’ve found it a little humourous reading the multitudes of stories from this publication since, preaching about integrity and godliness! That’s the two sides of Samoa for you!